Welcome! I’m Brandon Pugsley, just aand I have grown 6 businesses to more than 8-figures (wish they were mind), developed the Beyond Mastermind program, and develop digital funnels for business owners, entrepreneurs, those looking to add additional margin to their business. My goal is that as this document grows, it develops into a road map. A series of references that can help you as you grow your business, save you time and money, and accelerate your goals without having to repeat the mistakes that others have learned. Just a quick note about me. I’m Brandon Pugsley, and I have grown 6 businesses to more than 8-figures (wish they were mine), developed the Beyond Mastermind program, and I customize and develop digital funnels for business owners, entrepreneurs, those looking to add additional margin to their business. After all – I’ve never met a entrepreneur who wanted less margin! We are all looking to get better at what we do, to increase our impact, and frankly because there is soo much to learn it can become very time-consuming…. This page is here to help you. I have helped and consulted for many business owners, people who are experts at what they do, and probably like you in many ways. I often hear, “If I do this right, when do I get to practice _________(law, accounting, photography, guiding, chiropractic….well you get the picture)”. So, let’s simplify the jargon and break this down into a simple way of understanding this amazing tool we have available to us. 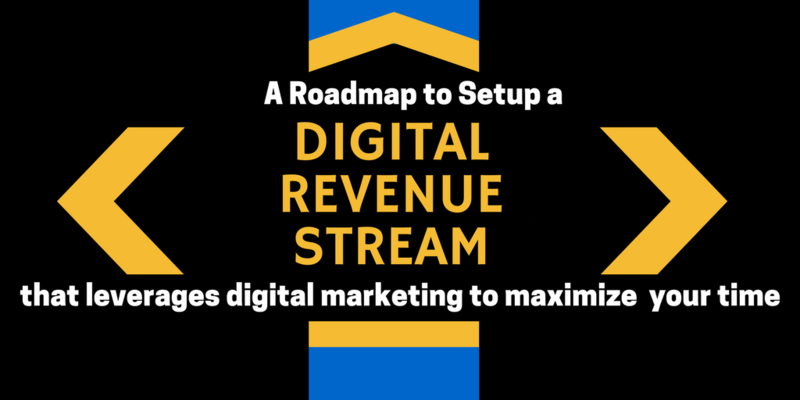 Why Should You Care about your Digital Revenue Stream? Don’t you already have a way to make money? Isn’t that a business…. Let me ask you a couple of quesitons. Simply put, adopting an effective digital business model is (in my belief) the BEST way for you to separate yourself from your competition! This simply provides you a way to look at your online presence and systems, and ensure that you are actually using these for something other than a postcard. Using your digital footprint in a way that changes the scope and scale of your business. A place where prospective customers don’t visit and leave just as quickly, but instead are nurtured and fed. Where potential customers receive real value that elevates your business vs. your competition, and turns your visitors into clients, customers, and fans! I’m sure that you can imagine your new customers, the sales and revenue that you are giving your competition right now because you do not have a method to capture who they are, or have any way to follow-up and transition them into a buyer for your business. Here’s the problem in a nutshell. All of us get hung up! We all get overwhelmed too. Even if you’ve had many years of marketing and business development experience, the pace of change in the digital world is staggering. If you’re stuck at your current level, you’re out of cycles, and know your customer base has began moving to the Internet to find your industry. Looking at a different digital business model isn’t nice to have….it’s a necessity. With so much information and so many systems available, someone who can guide you through that process and be a positive reference is invaluable. I’m sure you already figured out that finding the fastest way to take advantage of your digital business model provides you a critical edge which will separate you from your competition. It ensures that you are generating new customers (outside of your primary efforts), and provides value that will allow your business to expand beyond hand-to-hand growth. Are you using a systems-based approach? Many small businesses work from the basic approach of, “word of mouth” will grow my business. Many also have some systems in place to operate, and deliver within their offices and the traditional “brick and mortar” pieces. For most of us, this approach will allow us to scale our business to a level where you consume your available time, then growth becomes very difficult. Here’s an obvious understatement. The Internet provides you the most powerful set of tools ever created for your business to grow, and most businesses do not effectively take advantage of it! Do you have a website, but have no idea how to capture people visiting your site? Are you allowing hundreds or thousands of potential customers walk away without ever showing how valuable your business is for them? Do you know how to setup a funnel for your website? Do you understand how to follow-up with these propsective clients? Do you understand the different kinds of traffic that is coming to your website? Do you have a set of systems established to leverage your digital footprint and grow your business? There are three ways to grow a business…any business. Amazon, Apple, IBM, McDonalds, Starbucks, and thousands of small businesses use a straight forward system to take advantage of their digital business model (as well as their physical business) to move their visitors through a series of steps to transform visitors into customers. I call it your Digital Business model, and applying a systems-based approach here will revolutionize your business! Most businesses talk about strategy, and spend all of their time on tactics. The focus is on making payroll, covering overhead, etc. However, the opportunity for significant growth is tied to your strategy and implementing it effectively. And…there are many approaches that will work. We’re going to bring a lot of people into our business and focus at doing that at a breakeven point. At that point, we’re going to deliver a superior experience to them. From there, we will upgrade and upsell them to additional products and services. We’re going to provide value through free content, and then resell products and services to them over and over again. As we develop our relationship with them, we’re going to add new product and service offerings. We’re going to introduce other people’s free products and services that will compliment our performance. We are going to profit from these products and services, and we are going to establish products and services to maximize our profit. We’re going to take our existing product and service base, and expand it by developing new products, new services, and applying them to new markets. That’s a strategy (one that has been successfully deployed to 1000’s of businesses) that you could apply to your business, and being the process of using digital marketing to add revenue to your business. The tactics you employ are the methods, the approaches, the “how to” that you use to accomplish and execute your strategy. This is also commonly called a funnel. Here is an example of a straight forward funnel that takes advantage of your digital business model. 1. Identify your product or Service. Select a product that you can work to build into your system. This should not be your primary offer, or a high priced product/service. Reality check. If you don’t have an existing digital business model, you likely do not have very much traffic, nor do you have any credibility with the community that has interest in your product. The objective of this step is to identify a product or service that has sufficient interest to lead clients further into your sales funnel. Facebook, Twitter, LinkedIn, YouTube, Blogging, Social Media, Email List, Pay-Per-Click (PPC)….these are all sources of traffic and potential customers. With all the new rules that have been released Penguin, Panda, the new Facebook rules, the churn that comes from Twitter, thinking that you are simply going to post a website and get a significant amount of organic traffic is a risky approach for growing your business. A great analogy is the comparison of traffic to a commodity. Very few people grow rice for their family. You buy it! I often recommend a content strategy to build credibility, content, and authority with both your community and the search engines writ large. This will benefit your business and you build organic potential. Additionally, you will want to build a paid advertising approach to bring prospective clients to your best content, and “convert” them to a warm lead. This is a fairly advanced tactic, and is not something I recommend doing until the model is in place to actually capture prospective customers. A Lead Magnet is simply a Free resource that your provide in exchange for a prospect’s email address. In order for this to convert for you as a business owner, this must be a valuable resource. Virtually anything can be a lead magnet. However, it should relate to your core offering, and the content (product or service) that your potential customer has demonstrated an interest in understanding. A lead magnet that is unrelated to your core offer, and of limited value will not convert very well (if at all) and thus will need to be reexamined. It needs to be very specific and address a single pain point of your prospective audience. The single biggest mistake that I see in lead magnets is a lack of addressing a specific issue that delivers a win for your customer. Great examples of lead magnets are case studies, processes, how-to-guides, checklists, ebooks, swipe files, blueprints, mind maps, or virtually anything that is of significant value for your client. The other tip that has been relayed to me, and I pass on is: keep it short. Ideally, a lead magnet should be able to be consumed in 5-10 minutes. This is your initial or entry offer. It’s also referred to as a splinter offer, or a tripwire. It will likely be a smaller piece of your core offer, and provides a way to convert a potential customer into a buyer. Buyers are much more valuable to your business, as they are 10-15 times more likely to buy from you again, regardless of the amount of the initial purchase. Look at your core offer, and identify a few pieces that could be broken off and offered at a very low price point. Remember that the lead magnet should lead you logically to the entry offer, which then leads the buyer logically to your core offer. This basic workflow will be iterated as you add additional product and service to your model. Now’s the time. You have engaged a prospective client, and provided enough value for you to convert them into a buyer. Now you present your core offer to your buyer. There is significant power in the methodology, and how people process information. Present your core offer well, and focus on problems that this product or service will solve for your client. You are in an ideal position to capture their business. No matter how good your lead magnet, entry offer, and core offer are, there will be some buyers that need time to make a decision. Engage with them via your email list, and you will earn their business. In regards to your core offer, the basic premise is still very relevant: under promise and over deliver! Your prospect has made the journey from cold lead, to buyer, and has purchase your core offer. Ok, we’re now done right? Uh…no. Think about the last time you bought something from Amazon.com. After you selected your time and went to your cart, what did you see? That’s right, “other customers also bought”, and then a list of other products or services that are available. Really, you’ve already paid to acquire and convert this person to a buyer, do not lose the opportunity to maximize your ROI. Present them with as many logical offers as possible until they say, thanks but no thanks. Congratulations you have developed a single product thread with your digital business model. The significance and the beauty of this model, is that you can continue to develop and add threads to your business. This will create new customers, increase your sales, and even scale your business; and, you’re using the most powerful tools available to do it. Adding digital revenue through digital marketing is now a critical piece of your business. For small business owners, it is often completely neglected, or provided a minimum amount of attention. Not though neglect, but simply a matter of cycles. There are very few methods available to any business owner that will outperform a system-based approach that takes advantage of the technologies and market channels we have available today. By working through the approach provided, you are well underway to expanding your customers, increasing your sales, and scaling your business. I would love to hear from you! Please join me on Facebook, and say hello! Let me know what you would like to learn more about, and how this article has helped you in your business.